A master of physical comedy whose timing was impeccable, Buster Keaton would often wow audiences with his acrobatic feats and perfectly staged gags. In 1921’s The Goat, he gives all of these talents, and a few more besides, a damn good workout. Hoping to improve his luck, a vagrant (Keaton) tosses a horseshoe over his shoulder. Unfortunately, it hits a policeman square on the head, leading to a chase that sees the vagrant running for his life from a trio of cops. Things go from bad to worse for our downtrodden hero when he’s mistaken for wanted murderer Dead Shot Dan (Malcolm St. Clair). With a determined Police Chief (Joe Roberts) hot on his trail, the poor guy tries desperately to stay out of sight. But when he accepts a dinner invitation from a pretty girl (Virginia Fox), the Vagrant soon finds himself in more trouble than he ever imagined. The Goat is a madcap comedy in every sense of the word, with plenty of stunts and pratfalls to keep things moving along at a solid pace. 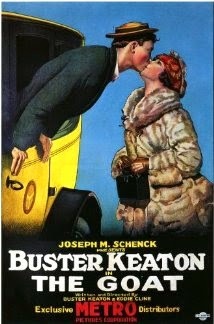 After inadvertently hitting the cop with the horseshoe, Keaton’s character (referred to as “The Goat” in the film’s credits) is chased through the streets, narrowly avoiding capture at every turn (He even lures the 3 policemen into the back of a delivery truck, which he then locks up tight. But the long arm of the law isn't through with him yet). Along with its action, The Goat provides a few inspired comedy routines, like when Keaton, in line for a free loaf of bread, accidentally stands behind two mannequins, then wonders why the line isn’t moving. Like most silent comedians, Buster Keaton appeared in a slew of short movies early in his career, and if the others are anywhere near as frantic as The Goat, it’s a miracle he survived long enough to make feature films!